Prestashop Affiliate Program : With Prestashop Affiliation Program you can allow your customers to register as affiliates and earn the reward for referring the customers and purchases made by those customers. Affiliation program is one of the best tools of marketing to promote your store online. It helps you in generating more traffic to your online store which further leads to increased sales. Prestashop Affiliate Program- With Prestashop Affiliation Program you can allow your customers to register as affiliates and earn the reward for referring the customers and purchases made by those customers. Affiliation program is one of the best tools of marketing to promote your store online. It helps you in generating more traffic to your online store which further leads to increased sales. Admin can enable/disable automatic approval of affiliates. 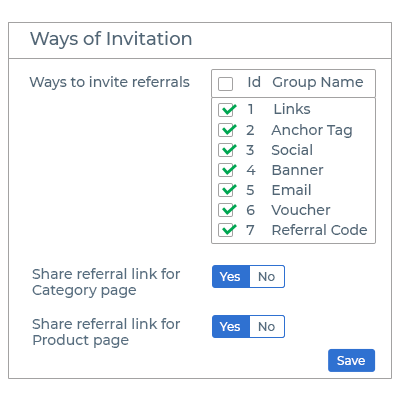 Provides multiple ways to affiliates for sharing the links with their referrals. Admin can set commission category wise, product wise, globally, and for registration. Admin can set validity for the affiliates. Admin can set the number of orders for which affiliates will receive commission. Admin can manually assign commission to affiliates. Admin can add multiple payment modes to transfer the pay out amount to the affiliates. A separate dashboard for admin to view commission stats affiliate wise and for all the affiliates combined. Increased traffic to the website by allowing the affiliate share the web link with the referrals. 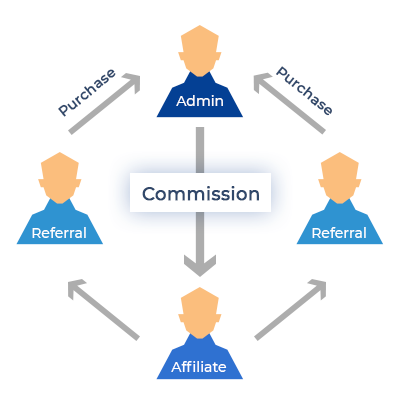 Commission to affiliates for referral registration. Commission to affiliates for referral orders. Affiliates can redeem the commission by generating a voucher or pay out request. Affiliates can share the vouchers with their referrals which can be used at the time of checkout while making a purchase. Affiliate program is one of the best tools when it comes to market your products online. You can allow the customers to register as affiliates who refer customers to the store through different channels. Affiliates are paid for the registrations and purchases made by their referrals. It helps you in generating more traffic to the store which leads to increased sales conversion. Affiliates can use links, banners, and voucher codes to promote your business. These can be shared on social media and will help you attract more customers to your store. You can set commission to be assigned to affiliates when their referrals registers or places orders on the store. You can set the global commission, category wise and product wise commission to be allocated to the affiliates for the orders placed by their referrals. You can also assign commission to the affiliates manually. Assigning commission to the affiliates motivates them to bring more customers to the store. 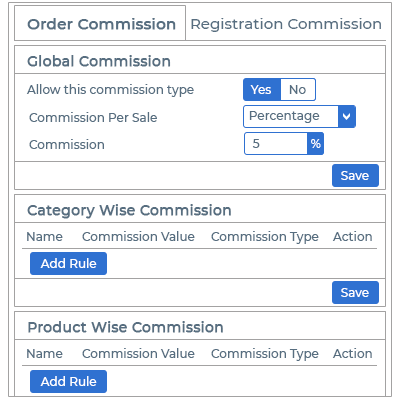 A separate panel in which an affiliate can view complete details of commission assigned for referral registration and orders and their status. 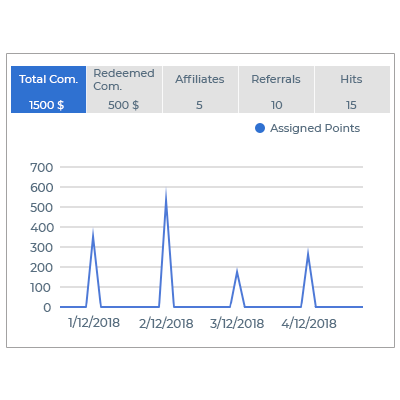 An affiliate can also redeem commission by generating a voucher or payout request in the panel. 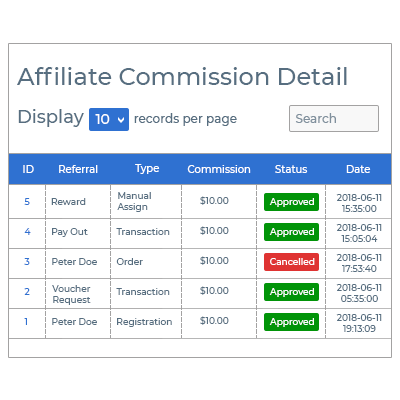 In the back office you can view total commission assigned to the affiliates for referrals registration, orders, or manually and total number of hits on the store. You can also view referrals, commission, and orders per affiliate. All these parameters will help you with promotional strategy for your store. Did you buy Prestashop Affiliate Program?